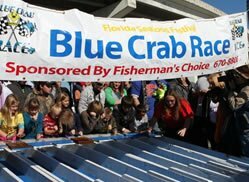 The Blue Crab Races returned to the festival 7 years ago after many years absence. Up to 20 children can participate at a time. The races are held at the top of each hour from 1pm to 5 pm on Saturday of the Festival. It is free to any children up to age 12 with prizes for everyone who participates thanks to its sponsor, Fisherman’s Choice. It is fun for the whole family make sure you sign up as soon as possible as the slots fill up fast. We provide the blue crabs and the fun!